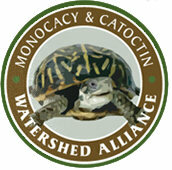 Monday August 15, 2011 was the opening week of the 63rd Montgomery County Agricultural Fair in Gaithersburg, MD. 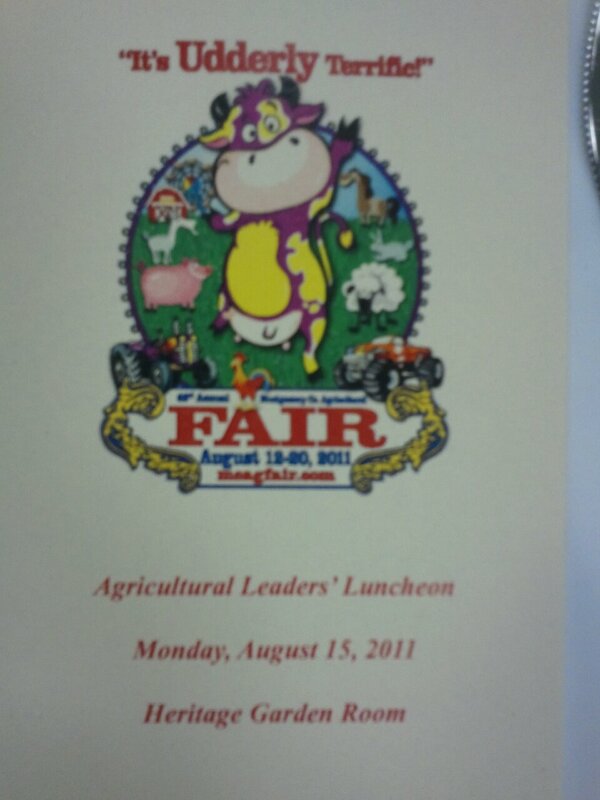 The Agricultural Leaders’ Luncheon was held in the Heritage Garden Room of the Fairgrounds the same day, sponsored by the Board of Directors of the Montgomery County Agricultural Center, the University of Maryland Extension, and the Montgomery County Agricultural Services Division. Attendees included Maryland Secretary of Agriculture, Buddy Hance, County Executive, Ike Leggett, several Congressional, Delegate, and County Council office representatives, members of various agricultural committees, various organizations and agencies like the Maryland Farm Bureau, NRCS, Montgomery County Soil Conservation District, USDA, The University of Maryland, as well as local farmers. Parts of the meal were provided by many different local farmers, giving everyone a taste of what Montgomery County agriculture has to offer. The Luncheon was held in recognition of the strong leadership in the Montgomery County Agricultural Community and its purpose was to bring together people within Montgomery County’s agricultural industry to share the successes of our vital agricultural economy and also to share some concerns. Several agricultural leadership awards were presented, an update on Agricultural Preservation was offered, and a presentation from the Agricultural Advisory Committee was given. 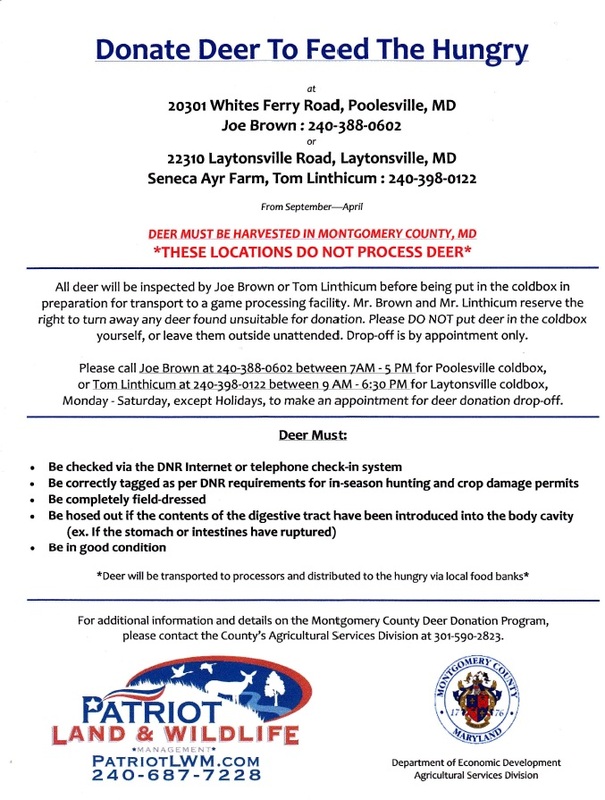 Within this presentation were updates on the Montgomery County Deer Donation program and the successes it has achieved over the last 7 years. 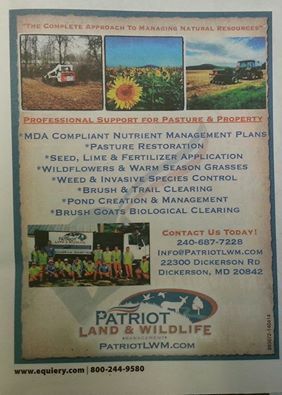 Patriot LWM manages this particular program and the support of the agricultural community, agencies, and organizations within the County have allowed it to blossom into a truly beneficial and successful program for Montgomery County.